In development for well over two years, GMUND Colors brings to you the world’s most sophisticated color match system. The product was developed using unprecedented testing on the psychology of color response. 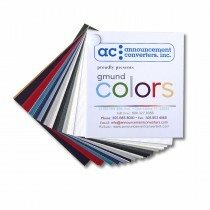 Designed to provide vibrant, modern and unique paper color choices, this range ensures every color compliments any other. The German engineering behind this range has also created a range of textures and finishes including Gmund Matt, Gmund Felt, Gmund Transparent and Gmund Metallic that are the height of elegance.